Today is rather different from usual. Firstly, my hair isn’t straight anymore. I had all the straightened parts cut out, and I’m back to my natural appearance. Received few weird glares and glances at the office, but could not be bothered to explain why I had haircut. Actually I didn’t want the hairstylist to cut my hair so short, and I thought I had already told him so. Nevertheless he still did, and I did not see it coming. Literally did not see, as I took off my glasses during the whole session. Another change was, for the first time, I took LRT from home to office instead of driving. I was naive to think that I would get a seat, just because I boarded the train at the first station. Heck, it was already jam-packed even then. I guess I will go back to driving to office again. Also, for the first time, I slept during lunch hour. It felt so good, so peaceful. I’m seeing myself doing this again, as part of a new lifestyle, new routine. Imagine, being able to sleep one hour late every night and have it replaced during lunch time. I could be more productive at my side work, or Go while eating less everyday. Eating less is becoming increasingly important day by day. I just realised I did not know how to spell “chlorine”. Had to check up dictionary for that. Perhaps I did not drink it enough. 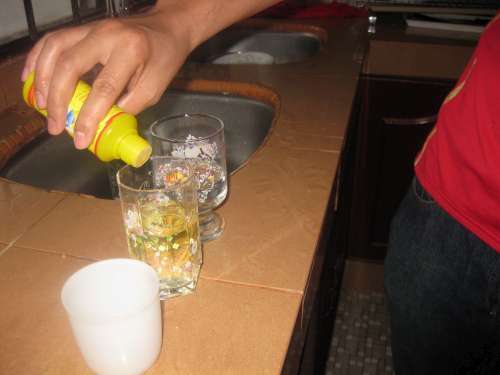 When chlorine tester liquid was added into a glass of tap water, the water turned yellow. The other glass which had filtered water remained clear. The climax of the experiment was when rice was added to the yellow water and stirred. The yellow water turned clear (or at least not yellow anymore as picture above). It was then concluded that when food such as rice and vegetables are washed with tap water, the food absorb chlorine and thus CONTAMINATED and HAZARDOUS ! Scientifically, the experiment was incomplete as it could be the case that the rice absorbed or dissolved the chlorine tester instead of the chlorine itself. My sister, Ire pointed that the correct way of conducting the experiment is to mix rice with water first to let the chlorine get absorbed. 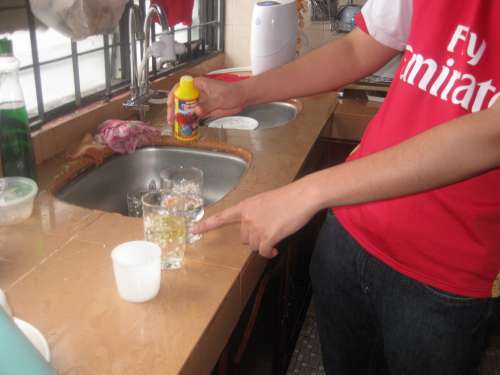 Then remove the rice, and add chlorine tester to the water. 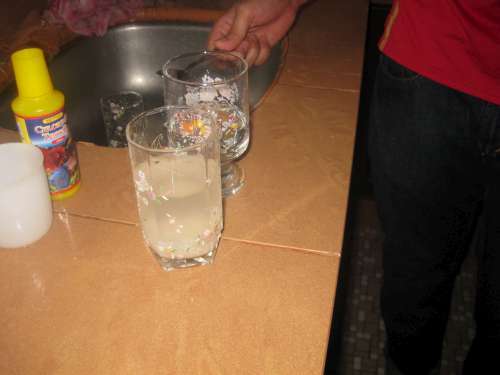 If it was true that the rice absorbed chlorine, then the water should not turn yellow. 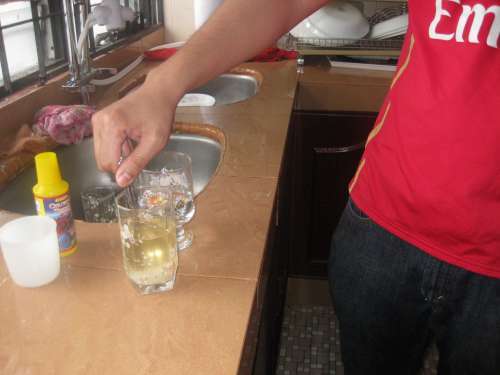 Anyway, we also tested mineral water with the tester and it did not contain chlorine (or negligible). When I was in Japan for WAGC, the Philippine representative, Martin asked me about Malaysian food. First thing came to mind was roti canai, then nasi lemak. Both of these are very unhealthy actually. Roti canai is quite oily, whereas nasi lemak is high in cholestrol. I couldn’t bring myself to mention these two to him, in the land of healthy sushis, sashimis and misos. I felt, inferior. Now I am filled with regret. I did not do justice to Malaysian food. Being healthy is not necessary to qualify as great food. In fact, comparing to processed food, Malaysian food is probably much healthier. But health aside, I can say Malaysian food taste really good, for example the ketupat and rendang daging above. My grandma made them, and I ate really a lot. 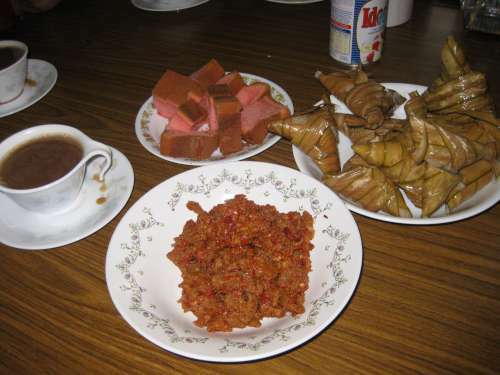 Each ketupat is probably equivalent to half a plate of rice. So you can imagine how full am I now. 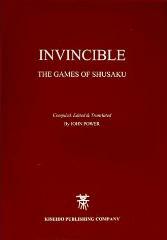 But now, I decide to start all over again. My health is deteriorating – more like I’m lacking energy to be precise. I got tired so easily, and become moody at work. Not to mention my worsening erratic psychology and emotion. Whatever it is, I want to regain my youthful energy so that I could jump and fly happily. The routine is not too hard this time. 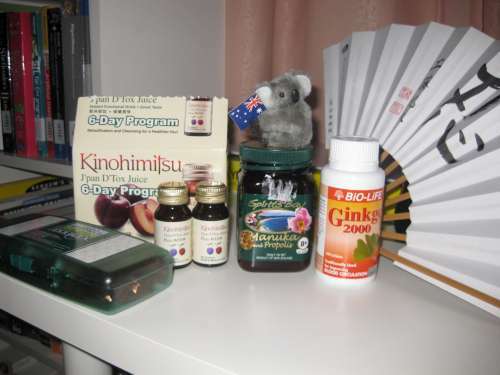 Ginkgo 2000 – 3 times a day. And a spoonful of Spirit Bay Manuka and Propolis Honey morning and night, and Nutrilite Double X. The detox formula? Maybe later. I took two bottles already, and each time the stomach cleansing was a bit uncomfortable. People have been seeing more of me lately. Haha.. that’s a weird way to say I’m fat !! I eat every time I’m bored. That’s quite a disease. And I eat everything free, feeling stupid if I dont. Tomorrow, an insurance lady is going to call me up to meet for lunch. Just when I start thinking of skipping meals. Perhaps I should say to her, “I’m on diet. I’m skipping lunch and I think you should too”. Pity her, I’m going to say “No” to insurance. Been so good at saying that lately. Well it’s not like they were going to be my girlfriend had I said “Yes” to insurance, Davidoff, iPod. Haha, detox plan already failed. She seemed very enthusiastic. She had just returned from an organized gathering where people listened to selected speakers talking about life, and shared the stories with me. I am usually against inspirational stories, and all those motivational books – but it appears that they can really changed people’s lives. At least for my sister who was “a doctor”, now changed to “a person whose profession is a doctor”. I dont know whether I should start listening to such inspirational stories and books too. I try to do everything myself, finding my own philosophy and understanding of life without help from others. Hmm, perhaps I think too much? Anyway American Go Yearbook is writing about me (not yet). Haha, rather lousy description about me generated from the questionnaire that I answered. Please put some human touch to the writing. Lately I’ve been feeling not my best. A short headache yesterday evening, which was quickly brushed off after a short nap. And I am starting to suffer from RSI (Repetetive Strain Injury) – from using the PC too much and from driving too much – and from exercising and stretching too little. As with mom’s suggestion, I think I will go detox for a change. Too remove all impurities, evil food from my body. However I was also scared by my sister’s story of someone went blind after over-doing Detox, by drinking 30 bottles of water a day. Of course, there’s also the whole argument that detox is unnatural, and the job of purification should be left the kidneys. Life is quite boring lately. I just want to start doing something new, even if it is detox.